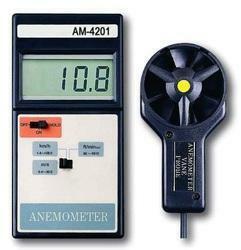 Used for ambient temperature, humidity, dew point temperature, wet bulb temperature, wind speed, and air volume. Large-screen LCD and backlight Data Hold Auto Power OFF USB real time data uploading functions. With the valuable assistance of skilled team of professionals, we are engaged in trading an extensive range of high quality Digital Anemometer. 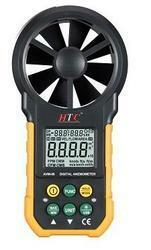 HTC Make Digital Anemometer / Air Flow Meter. Operating Humidity: Less than 80 % RH. Power Consumption : Approx. DC 9 mA. Display : 18mm (0.7") LCD (Liquid Crystal Display), 3 1/2 digits. Temp. Sensor: Naked-bead type k thermocouple probe.